RoseHosting was founded in 2001 being the first one to offer commercial Linux virtual servers with the vision of becoming a leading provider of business and personal web hosting solutions. They focused on quality equipment, stability and hand-holding customer support. Their strict No-overselling Policy guarantees for you that you are getting exactly what you pay for. For shared hosting solutions you can choose from 3 plans. You can start with SSD Basic with 1 domain, 2 GB SSD storage and 200 GB data transfer for $5,95/month and you can go up to the SSD Ultimate plan with 20 domains, 20 GB SSD storage and 2000 GB data transfer for $21,95/month. All of RoseHosting’s shared hosting plans include an easy-to-use graphical user interface and a control panel accessible through a web browser. 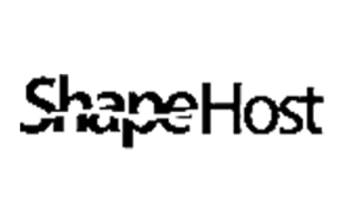 You can enjoy free weekly backups, DNS management and SSD storage, to help you during your hosting. Their shared hosting plans also include Softaculous and RVSiteBuilder Pro. RoseHosting’s VPS hosting plans you can find plenty of options to choose from. You can start from the SSD 1 VPS plan with 2 cores, 1 GB RAM and 30 GB of SSD storage for $19,95/month and you can upgrade up to the SSD 32 VPS with 10 cores, 32 GB RAM and 5001 GB of SSD storage for 319,95/month. If you don’t like RoseHosting’s 8 preset plans for VPS, you can choose to customize you VPS server. For the base features you can choose from a single core, with 512 MB RAM and 10 GB SSD storage for $25/month and you can upgrade up to 10 cores with 10 GB of RAM and 200 GB SSD storage for $452,06/month. For the operation system you can choose from CentOS, Debian, Ubuntu, OpenSUSE, Scientific Linux, ArchLinux and Elastic. You can also choose from various control panels of your liking. There is an option to add the VIP support for $20/month, but it is not clear what is included in this. 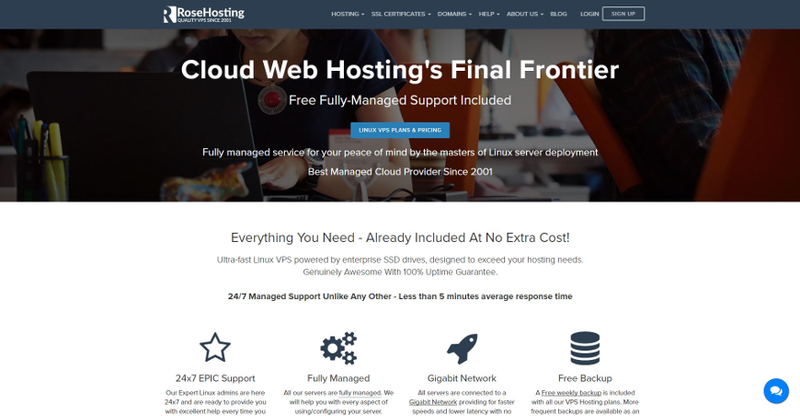 All of the VPS hosting plans feature full management, 100% uptime guarantee, SSD only storage, free full weekly backups, free website migration and a 24/7 epic support. RoseHosting’s cloud hosting is including their One-Click install app. You can install popular apps like WordPress, Joomla, ownCloud, Magento 2 and many more with a single click in less than a minute. There are eight plan you can choose from. You can start from dual cores with 1 GB RAM and 30 GB SSD storage for $19,95/month and you can go up to 10 cores with 32 GB RAM and 500 GB SSD storage. Their one click install cloud servers run the latest Ubuntu 16.04 OS with a LEMP stack (Linux, Nginx, MySQL and PHP-FPM) platform as web environment. The template is both lightweight and optimized for ultimate performance so your websites/apps will perform faster and better than ever. The cloud hosting also includes all the great features we seen in the VPS hosting plans. If you truly want the best performance you can check out RoseHosting’s Dedicated servers. The starting plan is a dual core Xeon E3 with 2 GB RAM and 500 GB RAID-5 storage for $299/month and the Highest performance is a 2x dual Xeon E5620+ with 32 GB RAM and 1000 GB SSD storage for $749/month. All of the servers run a Linux distribution of your choice and are tested for 24 hours straight before they are installed. This way they can exclude any hardware failure to ensure smooth operation for you. After they installation your server will be monitored 24/7 by an experienced staff. RoseHosting have a single data center in St. Louis, Missouri less than 100 miles from the population center of the U.S.. All of the servers are at least dual Quad Xeon CPUs, 128 GB of DDR3 RAM or more and have enterprise grade SSD storage. If you want to host in the US, they are a pretty good choice. You can reach their support by sending an email, call them on the phone or using the online chat system. Their reviews are full of good feedback, except a few complaint, which they are replying to fast. They support is great in the eyes of their users and fast to respond. 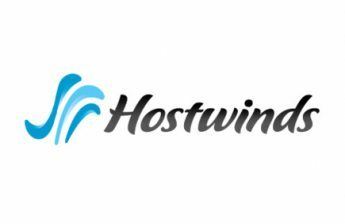 In this RoseHosting review we found that they offer fully managed plans with great features, 100% uptime guarantee and great support. Ont he negative side you can find cheaper plans at other providers and their data centers are only found int he United Sates. We are participating in RoseHosting’s affiliate program, but that does not affect any ranking or facts. We always give our own, honest opinion in our RoseHosting review.